‘Pilot’ your own 2-seater Buggy and take a ride on the wild side with an exciting Antigua Buggys tour! Perfect for off-road adventure lovers, this 4x4 action-packed excursion showcases all that Antigua has to offer. Take off in an intimate group of 12 or less people with a friendly and informative guide, and feel like a true explorer in one of our 2-seat off-road buggies. After your orientation it’s time to take the wheel. You will head across the island visiting Antigua’s best scenic spots and sights. The customized 4-wheel drive route will start in St John’s and head out of town, through dirt tracks and rural areas to beautiful Body Ponds, a series of ponds. You will blaze through the trails of Antigua’s one and only tropical rainforest to Fig Tree Drive. Continuing on, your next stop will be at the picturesque and pristine Valley Church Beach on the Southwest coast. Here you will stop for a drink while relaxing by the edge of this beautiful beach. Choose to relax or swim, and soak up the sunshine before your adventure winds to an end. On the way back, the scenery will continue as you journey slowly along the Coast back towards St John’s. Please note: This 4WD excursion is not for children under 7 and drivers must be 25 years or older. Buggys are for 2 guests and single guests will be asked to pay for 2 guests. Actual drive time is approximately 90 minutes. Wear comfortable clothing including a swimsuit, and bring along sunglasses, sunblock and a towel as well as your valid driver’s license. And remember to grab a camera to capture all the fantastic sights. The itinerary can change due to weather conditions. It is a 40-minute ride to the buggy facility. Guests will be required to sign a waiver to participate. What better way to take in the highlights of Antigua than by helicopter! The exhilaration of flying in a helicopter low over the crystal clear waters will be an experience you will never forget. You will be met at the ship by your tour guide and driven by air-conditioned minibus to the helicopter pad 40 minutes away from St. John’s where you will be briefed on your flight before beginning your adventure. You will then board your helicopter for a fully narrated and truly memorable tour ascending over Antigua's fabulous beaches and giving you a chance to see the entire circumference of the island, which includes over 100 miles of shoreline! Every beach, hotel, reef, and historic fortification is along the route. You'll skim the crystal clear waters of the West Coast, passing Five Islands, Jolly Harbour, Fig Tree Drive, over the extraordinary Cades Reef, and Rendezvous Bay. The super-yachts anchored at Falmouth Harbour will come into view, followed by historic English Harbour, Dow’s Hill, and Shirley's Heights Lookout. The tour continues past the famous Half Moon Bay, Green Island, and Stingray City as you hug the north coast and the outlying islands. You’ll pass Bird Island, Prickly Pear Island, and more beaches and fantastic scenery before passing Dickenson Bay and returning to our helipad close to St. John’s. Your tour will end back in Antigua with a bird's-eye-view of your cruise ship! Once you land, re-board your minibus for the transfer back to Falmouth pier. Please note: Route may vary due to weather conditions. The max weight to participate is 230 lbs. per person, max height is 6’ 4”. Actual flying time is approximately 25 to 30 minutes. The order of sights visited may vary. Participation on this tour is very limited. We recommend you bring a camera and comfortable walking shoes. Here’s a wonderful opportunity to play one of the Caribbean’s favorite championship golf courses. Cedar Valley Golf Club is home to the annual Antigua Open Golf Championship and is the only Antigua golf course to annually hold an OECS Golf Tournament. You will be met on the pier by friendly, experienced Tour Guides and taken to your waiting air-conditioned transportation, which will take you to Cedar Valley Golf Club, just 40 minutes from Falmouth Harbour. The beautiful course lies amid mature tropical trees with vistas of hills and the ocean providing an inspiring but challenging golf course, and is equally a memorable experience for non-golfers. The golf club accommodates and welcomes players of all skill levels. The course is set within exciting and breathtaking scenery, with a practice tee and green, a clubhouse lounge restaurant and a bar for drinks, snacks and lunch. There is also a pro shop should you need additional balls, tees, gloves, polo shirts, socks and shorts etc. Please note: Price includes green fees, a shared golf cart and return transportation. Club rental is available at US$30 per set and is not part of the golf package. The price is subject to change at anytime. Should guests wish to rent clubs, the fee is payable at the golf course only. Shoe rental is unfortunately not available. Non-participants who wish to partner a player are welcome at the fee above. This exclusive tour is limited to only 24 participants – and sells out quickly! You will be met at your yacht by professional guides and taken by air-conditioned vehicle to the Antigua Rainforest approximately 30 minutes away where your exciting tour will begin. This tour offers uncompromised safety including your state-of-the-art harness and safety helmet. Commencing at the Old Pump House, you will walk over a suspension bridge that spans the gorge to the far bank and take the first aerial zip. There are a series of 12 zip lines, 9 typical challenge elements, and 2 suspension bridges that will give you a bird’s-eye-view of the flora and fauna in the rainforest while you listen to the calls of numerous bird species. Please note: This tour includes some slight physical exertion and is not recommended for pregnant women, people with a history of heart problems, seizures, back, knee, or shoulder problems, or other pre-existing health problems. The maximum weight capacity is 235 lbs., and the minimum height is 5 feet. Participants should not wear strapless shoes or strapless sandals and women should wear shorts or long pants. A change of shirt is recommended. Also cameras are not allowed while doing this tour. You will be required to sign a waiver to participate on this tour. You will board your air-conditioned transportation and ride through Antigua’s countryside, rich in daily West Indian life, local villages, old churches, that exemplify West Indian culture, to Jolly Harbour. Here an experienced guide will give you a safety briefing on how to safely operate your 2-seater, 30 hp inflatable boat and you will have time to acquaint yourself with it. Then it’s time to follow your guide on a spectacular adventure along Antigua’s south coast in and out of bays and around reefs to Antigua’s premier snorkeling area, Cades Reef. Here you will be given instruction in snorkeling before you set out, explore and enjoy the home to the colorful Caribbean marine life including parrotfish, damselfish, grunts and angelfish among many others. Or you can simply take a swim or relax and soak up the sun in the idyllic location onboard the boat. You then will be guided back to Jolly Harbour for another opportunity to soak up the Antiguan sun before returning to the pier. Please note: Bring your swimsuit, towel and a camera. Snorkeling equipment includes safety buoyancy waistband, mask, snorkel,and fins; professional instruction and supervision by PADI trained Guides. Guests must be 18 years of age to drive the boats. Maximum weight of combined participants is 400 pounds.The tour is not suitable for guests with back problems, who are pregnant or non-swimmers. Guests will be required to sign a waiver to participate on this tour. You will be met on the pier by your guide and escorted to an awaiting air-conditioned taxi which will take you to Fort James Beach, 40 minutes from the pier. After a complete orientation on your Segway you will travel back in time to 1706 when the British built one of its most impressive forts to protect against French invasion. You’ll be amazed at how easy it is to maneuver this phenomenon of motion as it carries you through the large wooden gates of Fort James where a spectacular view of the Caribbean Sea awaits. Next you will embark on an entertaining adventure cruising by miles of beach in minutes on your zero emission Segway as knowledgeable and fun guides will fill you in on interesting facts about the area. After the tour enjoy delicious refreshments and cool drinks around a picnic table while indulging in a breathtaking view of one of the island’s most popular beach bars and restaurant. With time to relax on the beach you can catch up on that good read or take a dip or just do absolutely nothing. Your package includes Segway orientation, safety gear (helmets), guided tour, bottled water, soft-drinks, and time to relax on the beach. Please note: Bring your sun protection lotion, swimsuit, towel, and, of course, your camera! Closed toe shoes are recommended and women should wear shorts or long pants.Guests will be required to fill out a waiver before participating on this tour. Minimum age is 10. Minimum height is 4.5" and maximum weight is 260 lbs. This sightseeing tour begins and takes you to Dow’s Hill, for an amazing panoramic view and short guided tour of the area. Your vehicle will then head back south to the Island's countryside, exemplifying West Indies culture, and take in the magnificent view of Falmouth Harbour, English Harbour and Nelson's Dockyard. Your first stop will be at the Blockhouse Ruins, dating back to 1787, which are situated atop a sheer cliff 450 feet above the Atlantic. You’ll see uninterrupted views of Indian Creek and the prestigious St. James’s Club on Mamora Bay. The lookout at Shirley Heights, the island’s most southerly point nearly 500 feet above sea level, offers unparalleled views of the Atlantic and English Harbor. On a clear day the island of Montserrat can be seen, nearly 30 miles away. You will see the world’s last Georgian dockyard still in use and one of the eastern Caribbean’s biggest attractions. Nelson’s Dockyard Village was built in 1725. Your 45-minute stay will give you time to admire the sleek yachts tied to the old stone quayside and to explore the Admiral’s Inn, the museum, and the mystery pillars. A refreshing beverage will be offered at an 18th century inn before your return to Falmouth. Here is an outstanding tour and an opportunity to swim with, touch, and feed the stingrays of Antigua in the Caribbean Sea. The stingrays are very friendly and very gentle. You will board your air-conditioned transportation in Falmouth Marina and ride through Antigua’s countryside, rich in daily West Indian life, local villages, and old churches. Start your adventure at Stingray City’s land base where you can enjoy the company of their monkeys and parrots, and the hospitality of the experienced Stingray City’s Guides. Following your safety briefing a short speedboat ride will whisk you to a shallow pool with a white-sand bottom surrounded by a beautiful coral reef in the Caribbean Sea. You will be able to stand up or swim with the stingrays, who will greet you with the familiarity of an old friend. You will be given an opportunity to hand-feed the stingrays and capture the moment with photographs! After feeding, snorkeling, and taking pictures with your new friends, you will return to the land base where you can rinse off the seawater under the bright Caribbean sun, with a shower under a coconut tree, and enjoy a complimentary rum or fruit punch, browse in the gift shop, and share this unique experience with your fellow guests before your return journey to your ship. Please note: Wear your swimsuit under a cover up, bring a towel, and sunscreen. 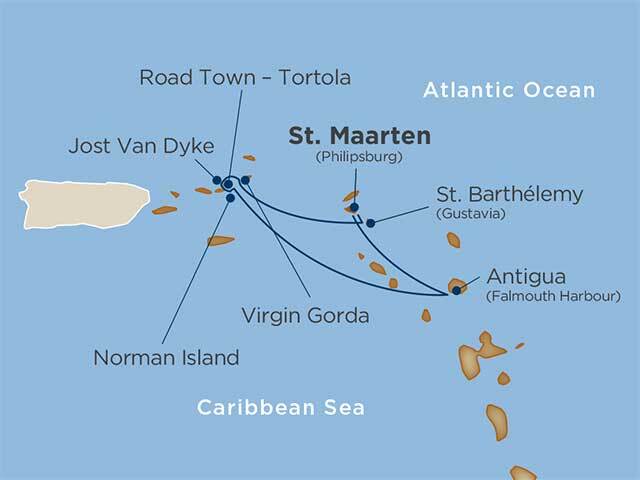 The best way to experience 80 different cultures in one day is to take the “Saint-Martin/Saint-Maarten Island Tour.” You will depart from Philipsburg and head to Oyster Pond, a charming little locale with a picturesque marina on the French side of the island. From there, following Coralita Road, along the coast, you will stop at a lookout point from where you can see St. Barth and Tintamare Island. You will continue past famous Orient Beach, well known for its clothing optional beach, past Grand Case, the Culinary Capitol of the Caribbean, on your way to Marigot, capitol of the French side. Marigot is best known for its seaside, open-air market, where you can find truly charming souvenirs of your Caribbean vacation. If you are “shopped out”, try one of the French cafés right next door, for a café au lait with a croissant. Upon leaving Marigot, you will make one more photo stop on Cay Hill, from where you have a wonderful view over Simpson Bay Lagoon. Your last stop will be Philipsburg, capitol of the Dutch side, best known for its jewelry-, electronics-, and high end clothing stores. On the Boardwalk you will find quaint restaurants for a quick bite to eat before your flight and an excellent photo opportunity of your yacht lying in Philipsburg Harbor. From there, you will be taken straight to Princess Juliana International Airport for your flight home. The best way to experience 80 different cultures in one day is to take the “Saint-Martin/Saint-Maarten Island Tour.” You will depart from Philipsburg and head to Oyster Pond, a charming little locale with a picturesque marina on the French side of the island. From there, following Coralita Road, along the coast, you will stop at a lookout point from where you can see St. Barth and Tintamare Island. You will continue past famous Orient Beach, well known for its clothing optional beach, past Grand Case, the Culinary Capitol of the Caribbean, on your way to Marigot, capitol of the French side. Marigot is best known for its seaside, open-air market, where you can find truly charming souvenirs of your Caribbean vacation. If you are “shopped out”, try one of the French cafés right next door, for a café au lait with a croissant. Upon leaving Marigot, you will make one more photo stop on Cay Hill, from where you have a wonderful view over Simpson Bay Lagoon. Our last stop will be Philipsburg, capitol of the Dutch side, best known for its jewelry-, electronics-, and high end clothing stores. On the Boardwalk you will find quaint restaurants for a quick bite to eat and an excellent photo opportunity of your yacht lying in Philipsburg Harbor. From there, you will be taken straight to your hotel.